Bar: 1.5" diameter solid maple wood. 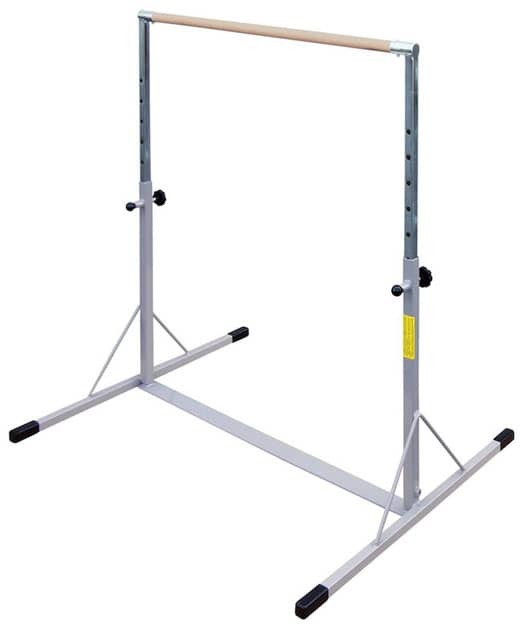 Bar height adjustable from 38" to an unequaled 58". 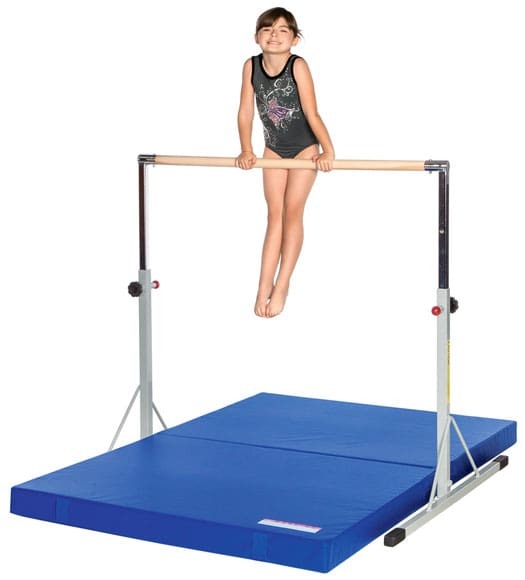 Bar height is secured using a snaplock/turnpin combination. 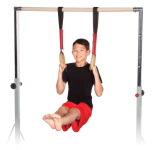 Flat spreader bar (parallel to the top bar) connects the two legs under the mat, adding extra stability. 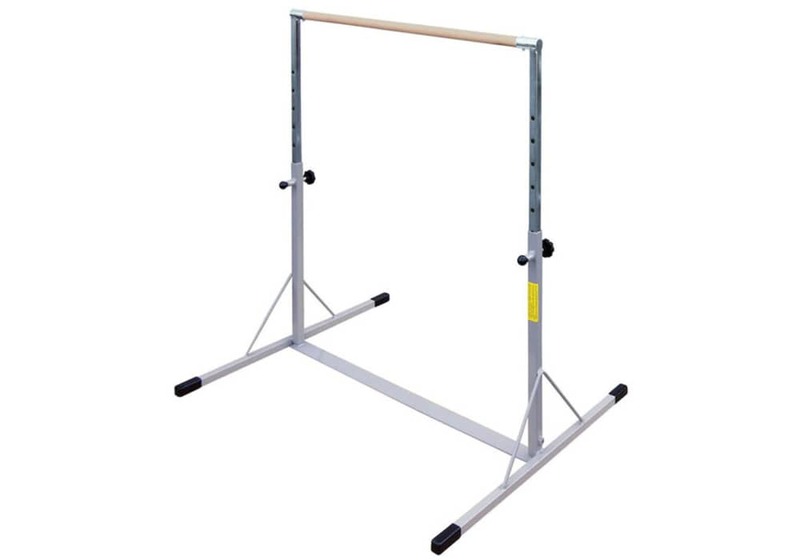 This is a great beginner's bar (up to a level 3 gymnast) to build strength and pull ups (not intended for kips or hip circles unless you bolt down the legs). Legs on uprights are 46" long. Therefore, the entire base is 46"x48". Product Weight: approx. 40 lbs. Weight Limit (of person using bar): 125 lbs. 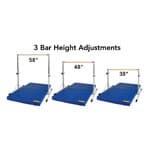 The 4' width between the uprights allows 4' wide standard matting to be used under the bar. Legs on uprights are 46" long. Therefore, the entire base is 46"x48". 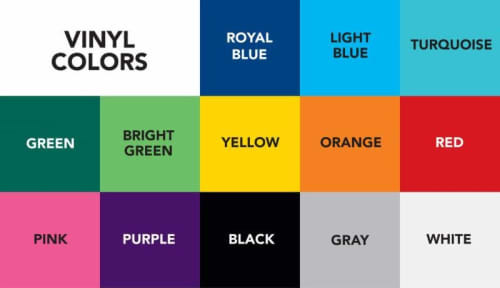 Mat Size: 4' x 6' x 4". 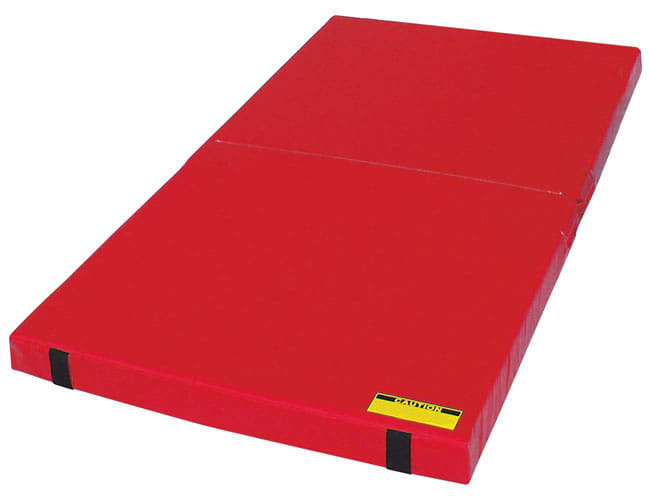 Mat folds in half to a folded size of 4' x 3' x 8". Mat Weight: 30 lbs. Mat will fit under our gymnastics mini bar, but is also narrow enough to use under most other mini high bars. It's covered with 18 oz. coated vinyl and filled with 4" thick 70 ILD polyfoam. The 48" space between the uprights of our mini bar also allows 4' wide standard matting to be used under the bar. Our gymnastics mini bar with a solid maple wood rail is a beginning gymnast's dream. 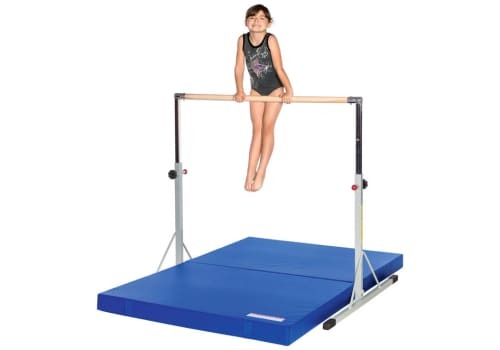 It features a rail that looks, feels and performs just like those used in competition, but slightly smaller diameter (1.5") and is just right to accommodate younger gymnasts' smaller hands. Base/frame is made of strong steel tubing with a spreader bar for added rigidity; all joints are welded. Steel surfaces are powder coated and the frame has nonmarring rubberized feet. Bar height adjustable from 38" to an unequaled 58". 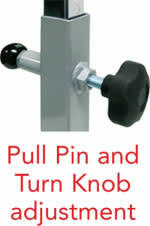 Bar height is secured using a snaplock/turnpin combination. 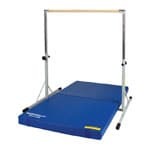 Flat spreader bar (parallel to the top bar) connects the two legs under the mat, adding extra stability. 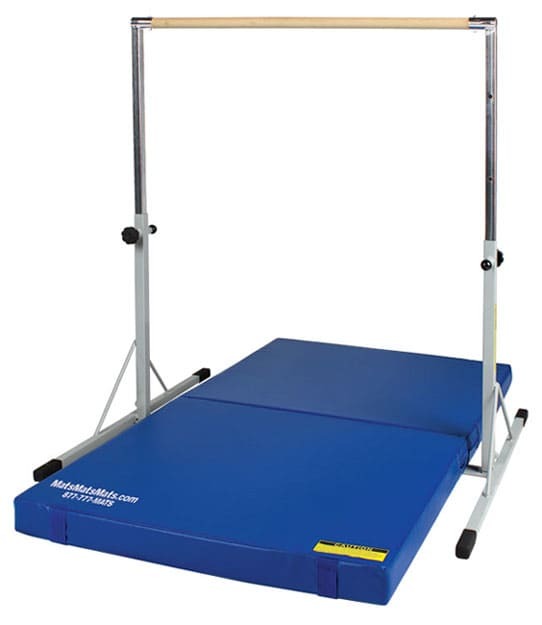 The 4' width between the uprights allows 4' wide standard matting to be used under the bar. Legs on uprights are 46" long. 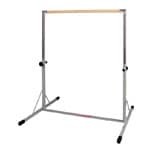 Therefore, the entire base is 46"x48"
Product Weight: approx. 40 lbs. Weight Limit (of person using bar): 100 lbs. This item cannot ship via U.S. Mail due to its large size. Please allow approx. 1-2 weeks for delivery.